The Golden Gate Bridge isn't the only thing to see at Baker Beach. Look in the opposite direction (always good advice on safari) and the horizon beckons. 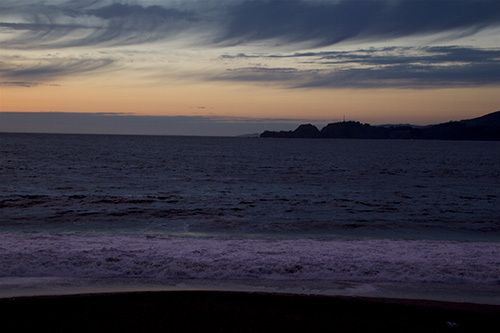 Baker Beach. 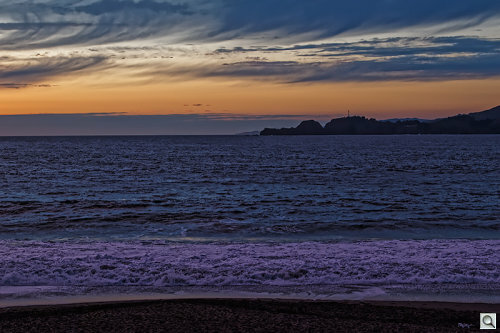 In the full-size image, you can see a flash from the lighthouse at Point Bonita in the distance and footsteps on the sand in the foreground. The capture, in Aperture Priority mode at 7:38 p.m. last Saturday, was f/5.6, 1/60 second and ISO 200 with a 35mm focal length on the 14-42mm kit lens. Like the picture of the bridge, it wasn't pretty when we got it out of the camera and onto the monitor. DxO Optics Pro 10 first for the Optics module correction and PRIME noise reduction, exported as a TIFF. The noise was worse than you might think at ISO 200. The image was all shadows, after all. Piccure+ for a little magic. We didn't think it helped the bridge much, but we had trouble recovering detail in the Marin headlands and the beach on this shot and it did help there. Photoshop CC 2014 for the final touches, including resizing. We also used Camera Raw to slightly increase Contrast and Saturation. And we couldn't resist adding a little Clarity. It was twilight, just moments before the bridge shot. What surf there was picked up the rose from the sky above (not the sky out to sea, which was already turning purple). These small thumbnails don't do the shadow detail justice, of course. But the full-size TIFF just takes our breath away. You can footsteps in the sand and the light on the Pt. Bonita lighthouse. Remarkable. The Original. This is the camera JPEG thumbnail stored with the DNG. What's remarkable, modesty obliges us to quickly add, is the difference between our rendering at the top of this story and the JPEG thumbnail the camera created for the Raw file, which is what you see on the LCD in Playback mode. The original would seem to have nothing to recommend it. But post processing makes all the difference. In the world.